Welcome to day 6 of the 31 day purging challenge. This task is going to be a scary one for me because today we’re tackling under the bathroom sink. My husband and I collect so much crap it’s ridiculous the stuff you’ll find under there and the stuff you can’t find because it’s buried. 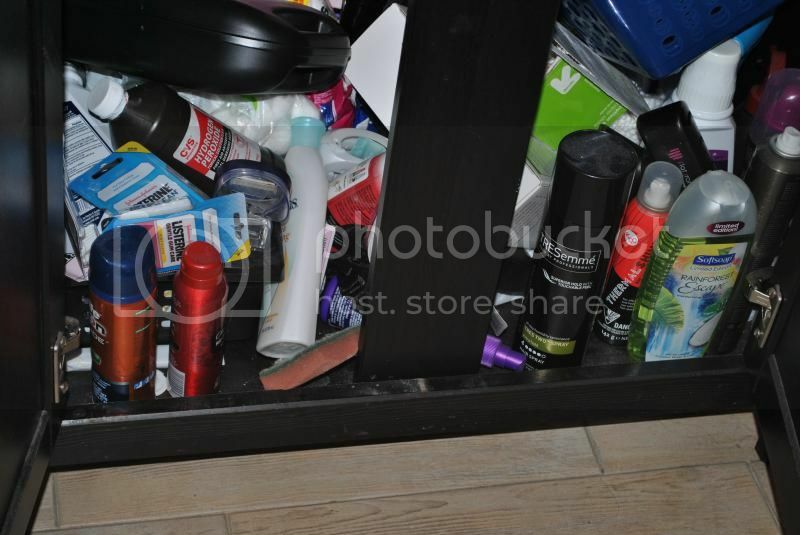 We’re talking hair products that have been under there for 4+ years and never moved or used, ew. It’s best to start by pulling everything out from under the cabinet. After that’s done it’s time to sort in 3 piles. Again I recommend heading to your local Dollar Tree or $0.99 store and grabbing some function baskets to make organizing a breeze. I sorted my husbands stuff into one basket and my stuff into another basket. I was shocked how much room I had left over when all was said and done! If you’re going to keep the items try to put them away in an organized manner and enjoy all the free space you’ll be getting. I’m so glad you followed along and be sure to share your photos on facebook, twitter and instagram using hashtag #31daypurgewithA2S4U. Stay tuned for tomorrow’s fun day of purging another area of the home.